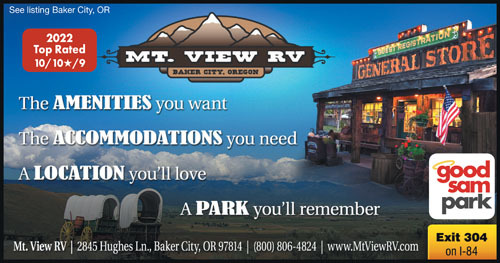 Full service RV resort with the rustic Oregon Trail charm & good old fashioned hospitality. 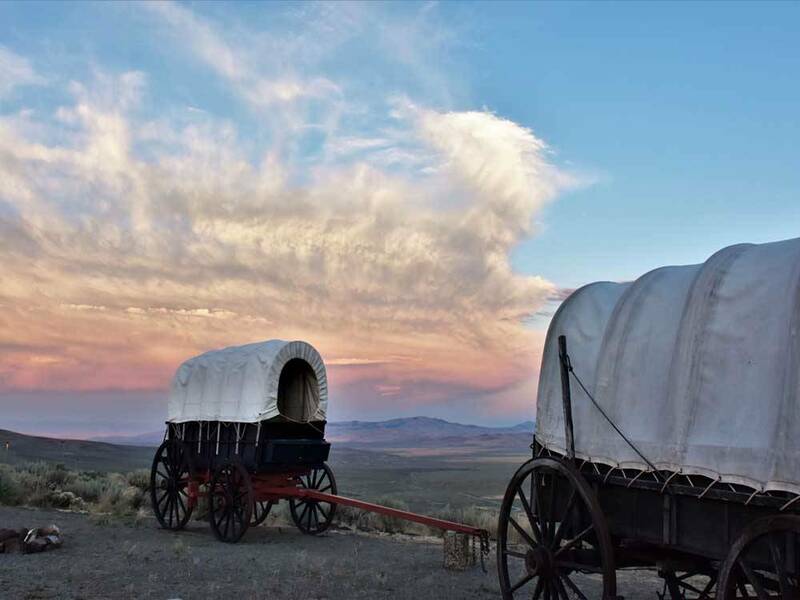 Come explore the Oregon Trail, Hells Canyon, Ghost Towns & Ntl Scenic Byways. Groups & big rigs welcome. Enjoy your pool, spa & Wifi. Love this park. Great sites, great staff, great location. Very close to downtown historic Baker City. So much to do in the area. The grounds are well maintained, the restrooms are super clean, wonderful store on site with all kinds of rv accessories and food items. They even have antiques to add to the ambiance of the park. The staff was super friendly. When we checked in, we felt the gal that helped us was like an old friend. Felt right at home. We will certainly stay here again. We stayed 1 night passing thru on I-84. The park is a short drive from the interstate (Exit 302 to miss going through most of town) along two lane roads. The interior roads are primarily gravel. They are narrow with parked vehicle encroachment & tight turns making maneuvering larger RV’s a little challenging. The traffic pattern requires looping back through the park to exit. There is a mixture of back-ins, P/T’s and tent sites. A few of P/T sites were long enough to say connected to a toad. The RV sites are narrow & there isn’t much distance between the sites but there was sufficient room to open slides. The parking pads are gravel. This park seems to understand the simple concept of the importance of a flat, level site as the sites were generally level and flat. They have full hook ups – water, electricity (50/30/20 AMP), & sewer. Water pressure was described as being 100 lbs. The utility connections were towards the middle of the sites. The sewer connection was slightly above ground making it difficult to establish a downhill flow depending on discharge point. Sites have an outside table but no fire pits. There were quite a few trees scattered throughout the park and around the perimeter so satellite reception would be dependent upon your site. The park information didn’t mention anything about broadcast channels but the cable lineup consisted of 30 channels. Didn’t try to get any broadcast channels. The park provided WiFi was acceptable. It was password protected. Didn’t try our Verizon WiFi hotspot or the NET10 phone so don’t know about reception. There was not a fenced pet area or designated walking areas. There was sufficient area to walk dogs along the park’s roads. There were no waste bag dispensers or collections stations for waste anywhere in the park. There was only 1 dumpster towards the middle of the park across from the office. We would probably stay here again if traveling through the area due to the limited number of options. TIP: Pull thru sites 123, 125 & 126 appeared to have clear access for satellite reception. Pull thru sites 116 & 117 possibly have clear access for satellite reception. Paizano’s Pizza delivered to the park. Make reservations due to the limited number of pull thru sites with satellite access. Another gem in the Goodsam RV parks. We were welcomed by the owner upon arival and given a very nice shady spot. The driveway in went through some permanent mobile homes, but the back looked like an RV park with plenty of shade trees and green space between campsites. The pool was clean and refreshing and the spa (hot tub) was equally clean. I did get to speak to the couple who clean the washrooms and laundry area. It is rare that we get to see and thank ??? ?the staff who do an amazing job maintaining washroom cleanliness. The grounds staff are equally polite and I had the chance to talk with them also. It is close to the interstate and many come in at night and leave the next day, however there were many of us who stayed for a few day. A lovely spot I would return to. We stayed here for a week to see the solar eclipse and then to explore Baker County. We had a wonderful stay. Easy to register and the hostess was very friendly and gave us advice on what to see and do. The park was very busy due to the eclipse traffic, but the site remained clean throughout this busy time and the staff always hard at work. Swimming pool was great for a few hot days and the laundry room/spa were also appreciated. The convenience store at the park was well stocked with good prices. We loved the location on the NW part of town - it was a very easy bike ride to get to downtown through the residential streets or on the Leo Adler Parkway. We had a great shady spot for the week and will definitely visit again if our travels take us in that direction. Office/store was in a cute western motif and was well stocked with necessities and gift items. Staff was very friendly and check-in was easy. Sites are packed gravel and the back-in site for our 25 foot motor home was pretty level. Park is attractive with lots of trees, and is clean and well maintained. Facilities were clean although we didn't use the showers or laundry. Pool was near the park entry which is a short walk from the majority of sites. Would definitely stay here again and recommend to anyone. Stopped for one night on our way to visit family. The park is a combination of mobile home park and campground and was surprisingly quiet, but very tight RV spaces. I'd be willing to stay there again though I would not want site 100 again as the I wasn't able to use the septic hook up because the septic fitting is recessed below a cement form preventing my septic hose 90 degree elbow from fitting with the hose attached. Very nice RV park. Bathrooms were very clean and staff very friendly. My AT&T wifi worked very well. Did not try park wifi. Only problem was that water was turned off as temps at night were below freezing. We ran out RV off our fresh water supply and used the Showers at the park. We spent 1 night here (sat.) during labor day weekend. Check in was fast and the lady was very friendly. We were provided site #100. It was a nice pull-through. It was level enough I didn't unhook as we were just there to spend the night while in transit. Their was a general store that was very nice and stocked with about anything one would need. We stayed three nights at this RV park. Although we didn't use the restrooms/showers and laundry provided at the campground, I did check them out, and they were super clean. We did not have problems with either the WiFi or the cable. We had to pay $2 a day for WiFi, and this worked on two tablets and two phones. It is quite obvious the owners care about their business. There was never any trash in the park. The lots are off the highway, and the area is quiet with a nice view of the mountains. We traveled with a small dog. There are several quiet roads close to the park to take a dog on a walk. We only stayed 1 night and weren't there long enough to use a lot of the facilities, but we were very pleased with the quality and cleanliness of the grounds, the restrooms, and the other facilities. The wifi access was the best we'd received at any of the RV parks we stayed at on this road trip. Given the opportunity, we'd stay here again, for a little while longer next time. Everyone was very friendly and helpful. Spaces were reasonably spaced and grounds were kept well. Not on a highway so it was quiet. Overall, very pleased. We stayed for two nights and would stay again. When driving to check in don't let first glances stop you. Mobile homes line both sides with empty RV sites in middle separating the two sides. Check in person was very nice; sites are gravel and spacing adequate. If you have time, take in the Oregon Trail interpretive center. You can spend hours in there. Also ask at the check in desk where to get a good steak. We did and the place that was recommended was awesome and the food good. From Jct of I-84 & Campbell St (exit 304), W 1.5 mi on Campbell St to 10th St, N 1 mi to Hughes Ln, E 1000 ft (R) After turning in, office is 300 feet straight ahead.